Plausibility has never been a major characteristic of the Bond movies, but it does seem a bit much to be expected to believe that every film between Dr. No and Die Another Day concerned just one man. If we are to assume that the same agent is depicted in each and every one of these movies, then we must also accept that by the time of Die Another Day Bond must be at least 70 years old! It is not possible to argue that the films take place over a period of significantly less than four decades, because they contain so many contemporary elements - such as technologies, cars, fashions, and the years of Bond's favourite Dom Pérignon - all of which date them considerably. So, do we instead assume that the initial phase of Bond-movie continuity only extends so far (say, to the end of Roger Moore's tenure) and that subsequent films (say, the Timothy Dalton and Pierce Brosnan ones) are part of some other continuity (like the infinite Earths occupied by DC Comics' superheroes)? 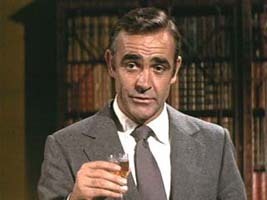 Or do we begin to wonder whether the agent known as James Bond might not always have been the same man? There is a degree of circumstantial evidence which suggests that "James Bond" is an identity that has been assumed by a number of different operatives. 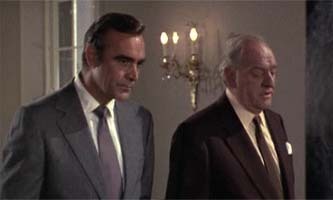 Following the murder of Tracy (Teresa) Bond (Diana Rigg) in OHMSS, we see 007 (Sean Connery) going after Blofeld (Charles Gray) at the beginning of Diamonds Are Forever. However, Bond's ruthless yet light-hearted attitude and his parting quip, "Welcome to hell, Blofeld," are at odds with the bereaved 007 shown at the end of OHMSS. Can it be that the Lazenby and Connery Bonds are indeed different agents? M's (Bernard Lee) comment in Diamonds Are Forever, "May I remind you, 007, that Blofeld's dead. Finished! The least we can expect from you now is a little plain, solid work," would seem incredibly insensitive if he were addressing the same agent who had recently lost his wife. 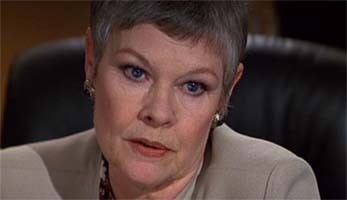 The same goes for Moneypenny's (Lois Maxwell) request that Bond bring her back an engagement ring from Amsterdam. Is it therefore possible that Lazenby's Bond was recruited to replace the retiring Connery Bond, in order to trick the enemies of the British Secret Service into thinking that its best agent was still active? Curiously, this very idea was used in the plot to the 1967 spoof version of Casino Royale, even before George Lazenby had been cast in OHMSS! Perhaps Blofeld (and any other old adversaries who happen to meet a new Bond) assumes that 007 has had plastic surgery as part of his cover. Maybe the death of Tracy drives Lazenby's Bond to suicide or a nervous breakdown following OHMSS, and so Connery's Bond is persuaded to return briefly to service. In The Living Daylights, when Bond (Dalton) asks Saunders (Thomas Wheatley) why the defector Koskov (Jeroen Krabbé) asked for him as the marksman to protect him, Saunders' sardonic reply is: "He's under the impression you're the best." Could this be more than just a snide comment, but rather an indication that Dalton's Bond is in fact relatively new to the job and is riding on the reputation of his predecessor(s)? GoldenEye features a radio telescope hidden in a lake, which is more than a little reminiscent of the concealed volcano base in You Only Live Twice. 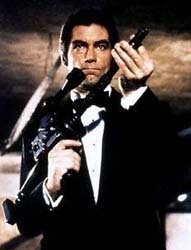 Yet Bond (Brosnan) does not seem to notice the similarity. Could this mean that he is not the same agent who was active during You Only Live Twice? On a similar note, Brosnan's Bond cannot decipher the symbols on a Chinese keyboard in Tomorrow Never Dies, even though Connery's Bond boasted that he "took a first in Oriental languages at Cambridge". This all adds weight to the idea that "James Bond" is merely a code identity that a succession of agents of a certain temperament and ability have been assigned to operate under. In light of this, M's promotion of Daniel Craig's Bond to Double-0 status in 2006's Casino Royale could be interpreted as not simply a rebooting of the movie franchise but the initiation of the latest in a long line of agents to operate under the code name of James Bond. A similar process might be applied to the different actors who have played Bond's equivalent in the CIA, Felix Leiter, and even Miss Moneypenny. The appearance of John Terry as Felix Leiter in The Living Daylights, which occurs between David Hedison's roles in Live and Let Die and Licence to Kill could indicate that Terry's Leiter was a temporary replacement for Hedison's. Alternatively, it might mean the events of Licence take place before those of Daylights. The activations and departures of the numerous Bonds could have happened thus: Connery's Bond retires after You Only Live Twice, but is briefly brought back into service for Diamonds Are Forever, after which he retires or is killed in action. Lazenby's Bond is driven to suicide or a nervous breakdown that leads to an early retirement following his wife's death. 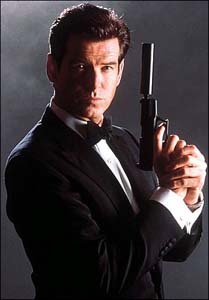 Moore's Bond retires or is killed in action following A View to a Kill. Having continually defied M's orders, Dalton's Bond is dismissed for insubordination or resigns after his two missions. 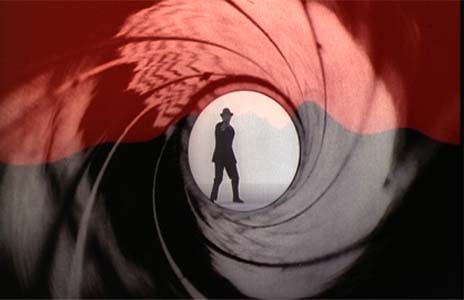 The "NINE YEARS LATER" caption following the opening titles of GoldenEye could simply indicate that the majority of the movie is set nine years after the Dalton films. Brosnan's Bond retires or dies some day after Die Another Day. References back to movies starring other lead actors are rare in the Bond series, though the allusions to the death of Tracy Bond in The Spy Who Loved Me, For Your Eyes Only and Licence to Kill do pose a slight problem. The instance in The Spy Who Loved Me could merely be a case of 007 (Moore) confirming his official identity to the Russian agent Anya Amasova (Barbara Bach). 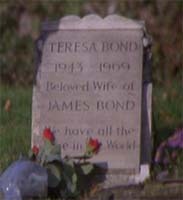 His visit to Tracy's grave at the beginning of For Your Eyes Only might similarly be for the purpose of backing up his cover story. Alternatively, his apparently genuine remorse could indicate that it is also the (unmarked) grave of the Lazenby Bond, who might have been a colleague and friend of Moore's Bond. The reference in Licence to Kill to Bond (Dalton) having been married before could refer to another woman. 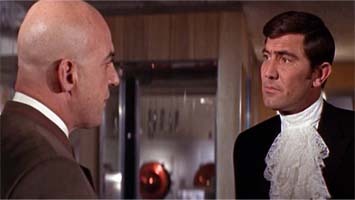 The only other direct cross-references to the adventures of a previous Bond are in OHMSS, in which Lazenby's 007 examines souvenirs from Sean Connery's tenure. However, he might have just inherited these from his predecessor. If you're a fan of Doctor Who, then Bond's changing appearance and ageless longevity could be reconciled along with the above continuity references if you assume that 007 is a Time Lord! I'm not the first to propose this outlandish mythology-crossing theory. There's an intriguing web-based round-robin crossover story entitled From UNIT With Love, which documents an adventure shared by the Third Doctor and Brosnan's Bond, while the Doctor Who novel Bullet Time by David A. McIntee briefly mentions "MI6's Time Lord". It is true that GoldenEye makes reference to Bond's parents, but this needn't rule out the possibility that 007 is a Gallifreyan. The story regarding his parentage might be an official fabrication; his parents could have been Time Lords living on Earth; or maybe, like the Doctor, Bond is half-human. Bond's failure to notice the similarity between the hidden radio telescope in GoldenEye and the volcano base in You Only Live Twice (mentioned earlier in this feature to demonstrate that the various Bonds might be different agents) could indicate a lapse of memory on the part of the Time Lord. After all, far more than 30 years might have elapsed for Bond, given the possibility of him taking extended trips in his TARDIS between cases. His failure to comprehend the Chinese keyboard in Tomorrow Never Dies could suggest that 007 was boasting when he claimed to have taken a first in Oriental languages. After all, Time Lords (via their TARDISes' telepathic circuits) seem to possess the ability to understand most spoken languages anyway. 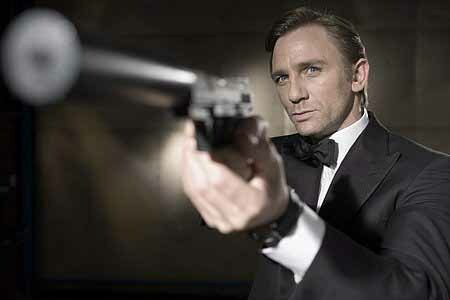 Thus Bond is a very cunning linguist, but cannot always interpret written languages. Daniel Craig's 007 could be regarded as occupying a separate continuity than the Bond films that preceded him - or he might actually be an earlier incarnation than Connery's Bond, displaced in time. Perhaps M, prior to the events of Casino Royale, is reluctantly forced to promote the newly arrived blond Bond for fear of damaging the timeline if she does not. Maybe she knows (from secret files or from conversations with Brosnan's Bond) that back in the 1960s the Time Lord arrived at MI6 having already gained Double-0 status (with papers to prove it) in Earth's future. M's hostility towards this still rough-around-the-edges incarnation could be an expression of her annoyance at having her actions (the promotion of Bond) determined by causality rather than her own free will. The death of Bond's lover, Vesper Lynd (Eva Green) could be one of the factors that leads to Connery's Bond being so cold-hearted and callous. If we buy into the Time Lord theory, then other characters, such as Leiter, Moneypenny and Blofeld, might be Gallifreyans as well. 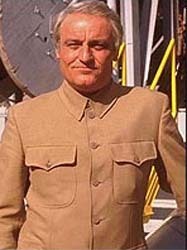 Just as the second incarnation of Romana (Lalla Ward) based her appearance on Princess Astra of Atrios, we see evidence that Charles Gray's Blofeld modelled himself upon the likeness of Henderson in You Only Live Twice! As with Bond's potentially time-displaced appearances in Diamonds Are Forever and Casino Royale, time travel could also explain the presence of John Terry's Felix Leiter in The Living Daylights, in between David Hedison's appearances in Live and Let Die and Licence to Kill. I would theorise that it is the John Terry incarnation who is "out of sequence", visiting his own future, so to speak. The fact that Bond (Dalton) momentarily believes that Felix is dead in Licence to Kill suggests that the Hedison incarnation is Felix's latest form at the time. Alternatively, as suggested earlier, perhaps Licence takes place before Daylights for all concerned.